People for Animals Hyderabad, an NGO devoted to fighting for animal rights as well as animal welfare at Hyderabad, has spent over 15 years fighting for the cause. We are proud to provide excellent and compassionate care to all animals, and to raise awareness to make the city more compassionate towards the voiceless. We are relentlessly working towards materializing our vision: A world where social sanction would deter violations of animal rights, where animals and environment are understood and accepted as being an intrinsic link of the chain of life. 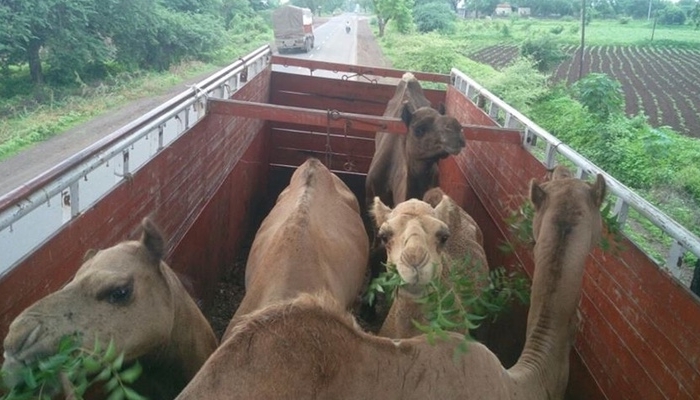 On the 4th of June, 87 camels that were being taken for slaughter were spotted by a PFA volunteer. 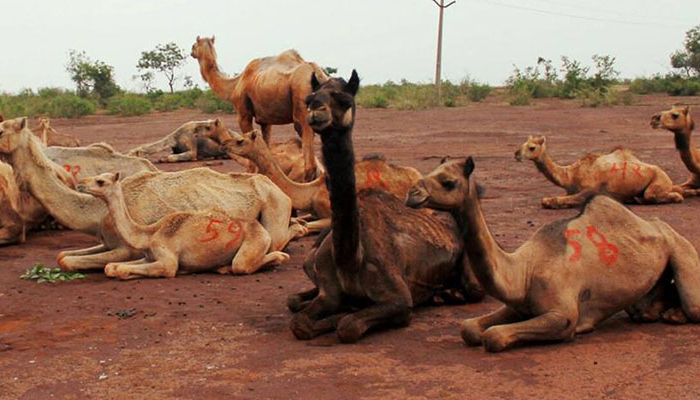 These poor camels were made to walk all the way from Rajasthan to Bantwaram, over the distance of 1,372.4 km, with the motive of selling them off in the meat markets at Hyderabad for slaughter. 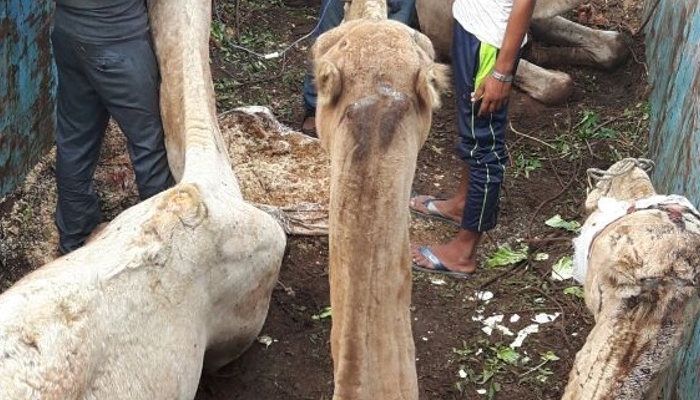 On the 4th of June, Team PFA led by Executive Officer Mr. Dattatraya Joshi; GHSPCA, Bharatiya Prani Mitra Sangh and other senior volunteers like Srinivas Rao and Shantilalji sprung into action and stopped the camel handlers. 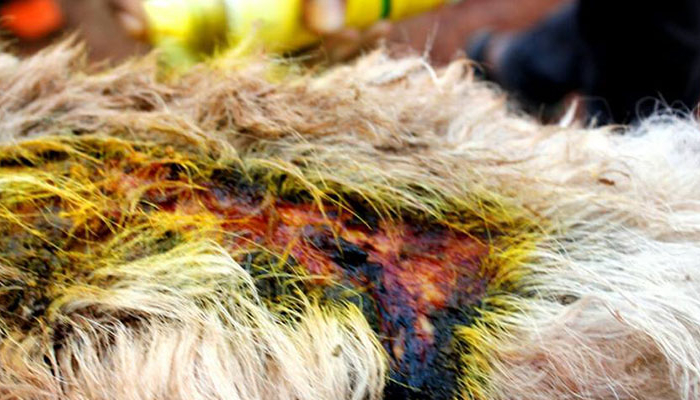 An FIR was lodged against the accused on the same day and the interim custody of the animals was granted to PFA. 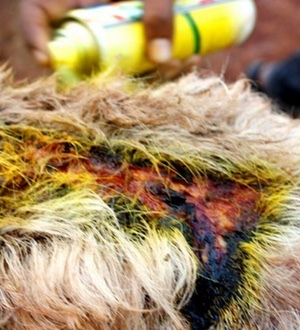 After the rescue we found that 90% of the camels were sick. They were dehydrated and starved with their ribs showing, and their hooves were damaged due to the long walk of over 800 miles. They were not given enough food or water during the journey. 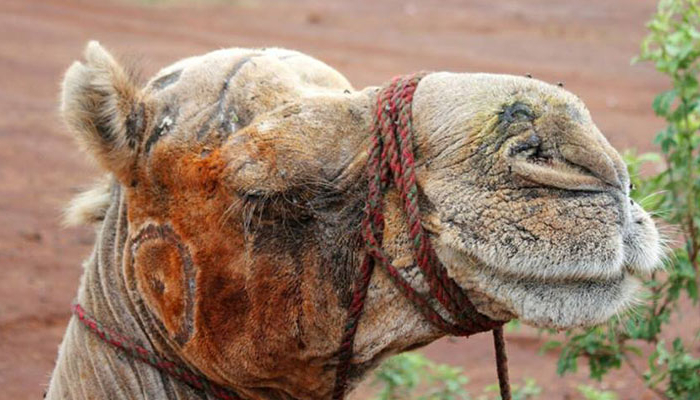 All the camels were wounded badly due to resting their huge bodies against the tough surfaces as opposed to the soft sand that they’re used to. 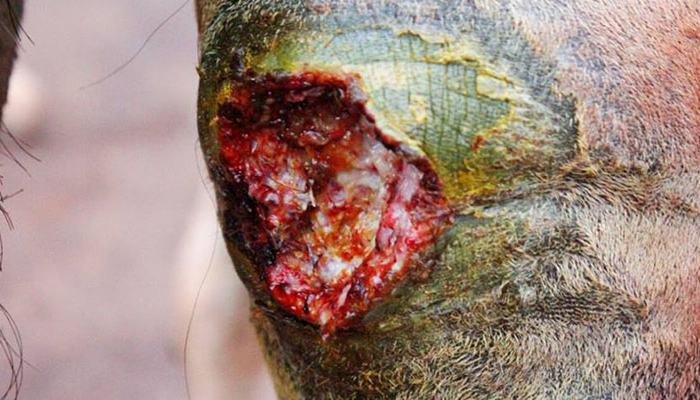 The unattended wounds during the long travel were now severe with maggots eating away their live tissues from the inside. There were pregnant camels, calves and lactating ones as well. 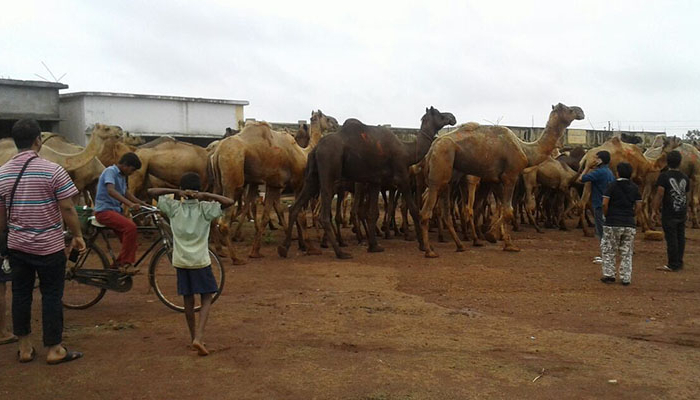 On the 5th of June, nine of the camel handlers who had been produced in court for violating IPC section 429, PC Act and Transport rules were sent to Cherlapally jail in remand for two weeks. 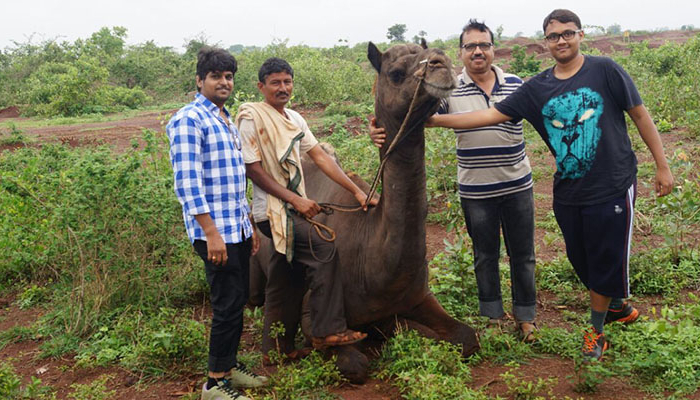 On the 22nd of June, the petition filed by the camel butchers had been dismissed by the Vikarabad Magistrate. 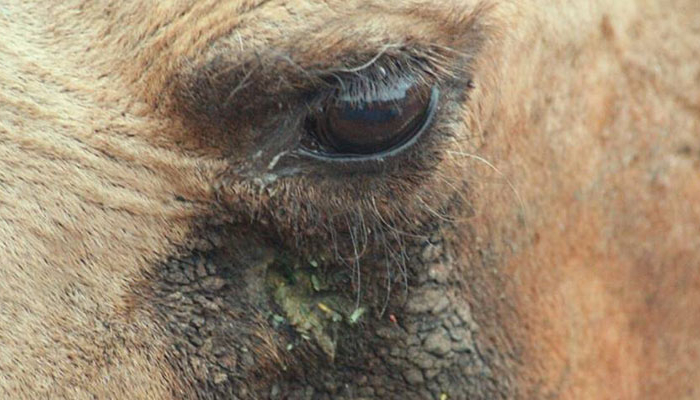 The court didn’t accept their ownership of the camels in the first place! 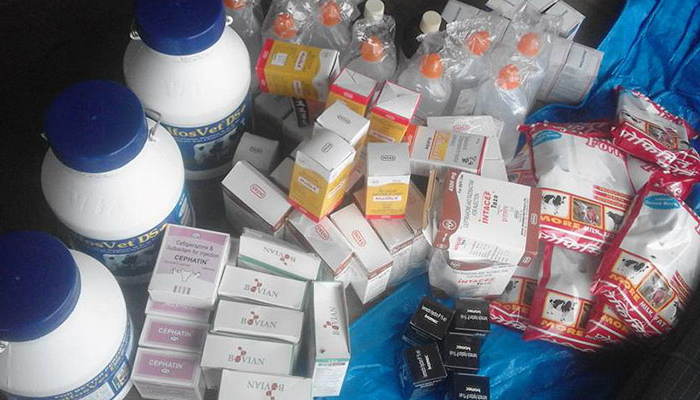 We would like to thank the honorable magistrate, the entire PFA Team, GHSPCA and BPMS. 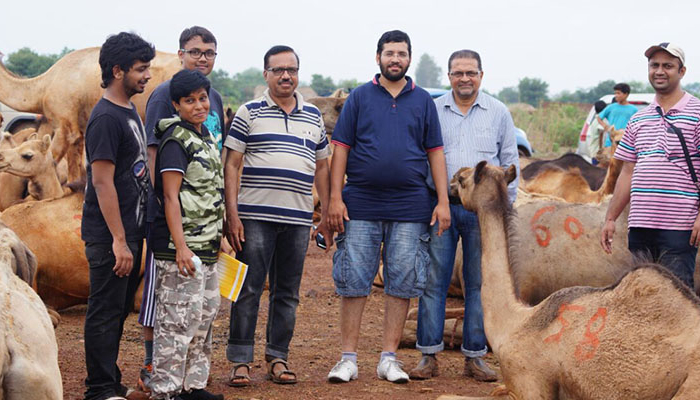 We need at least 2,000 kgs each of two varieties of camel feed, called Kutti (straw powder mixed with nutrients, ideal food for camels) and Bhoosa (consists of straw powder only). 1 kilogram of kutti costs about 50 rs and 1 kilogram of bhoosa costs around 30-40 rupees. Also, the pregnant camels require better nutrition and the lactating ones do too as they’re very weak right now and aren’t able to nurse their young ones properly. Along with these, fresh green leaves also need to be fed to maintain a balanced diet. 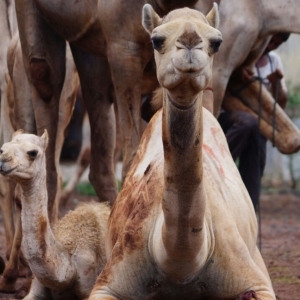 Transportation of a large number of camels is a difficult, slow and expensive process. We shall need to hire at least 23 trucks to fit the 90 camels, 4 in each truck. 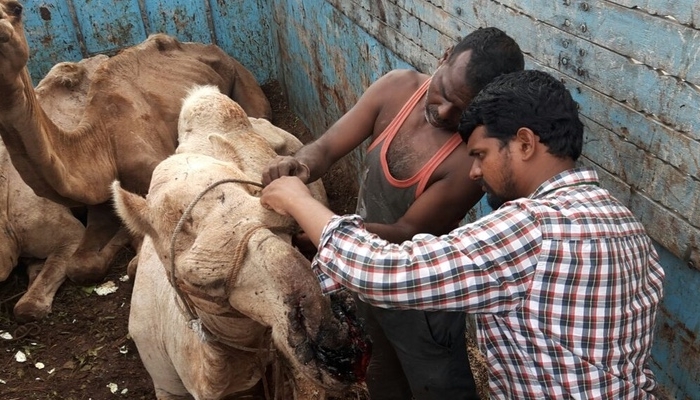 The camels are carefully lifted using a crane as they’re too scared to walk into the trucks voluntarily. The process takes about 48-72 hours. The trucks are then made to move slowly at about 20-30 kilometres per hour, halting in between to feed and rest the animals. The ropes are untied frequently and the camels are made to move around within the trucks for exercise. We need to travel across Maharashtra, Gujarat and Rajasthan to reach the destination, PFA Sirohi. The entire journey takes over seven days. 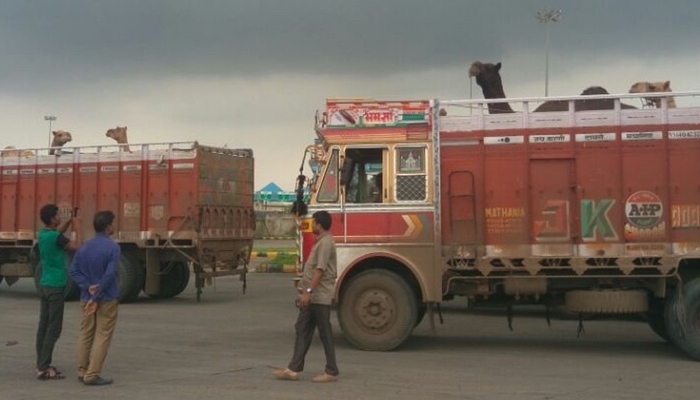 We need to hire at least 23 trucks to fit the 90 camels. We also need a crane to carefully lift the camels and place them in the trucks. This takes about 48hrs, based on how the camels cooperate.